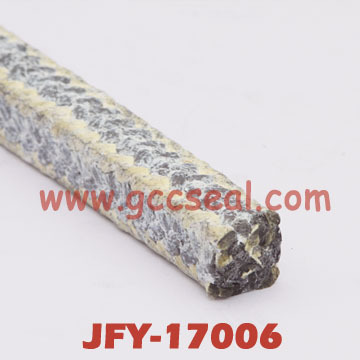 Lattice braided flexible graphite packing with aramid fiber corner reinforced. It offers the strength of aramid fiber, the thermal dissipating and low friction property of graphite. The graphite particles in packing enhance the heat exchange effective. However, due to the toughness of Aramid we recommend shaft (sleeve) hardness > 60 HRC.